The objective of the project was to upgrade the previous coating system that had been put in place. After assessing the condition of the tank, it was determined that an overcoat system would be best for the project. After preparing the tank’s surface, Tnemec’s Series 700 Hydroflon was applied to the tank in Old Glory Blue, Old Glory Red, and Tnemec White. Tnemec coatings consultant with Southeastern Resources Inc., Dean Drehoff, explained the project team’s coating choice. The high-performance fluoropolymer employs Lumiflon FEVE resin technology that prevents chalking, fading, and coating degradation. The color and gloss retention of FEVE-based fluoropolymers offers coatings an unparalleled experience in which the coating is expected to remain intact for decades. “The town, the utility department, and the [applicators] are very happy with the patriotic overcoat,” Drehoff shared. 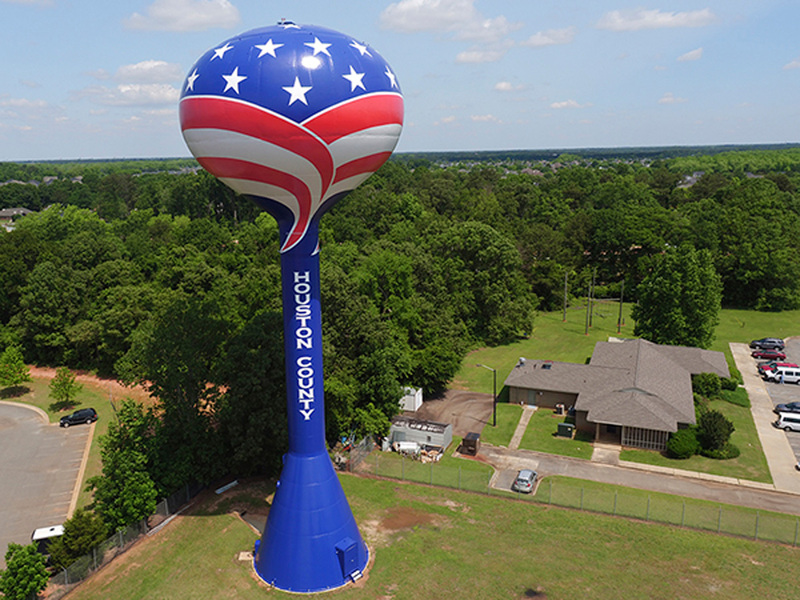 In 2016, the Houston County water tank was selected as the 2016 People’s Choice Tank of the Year.